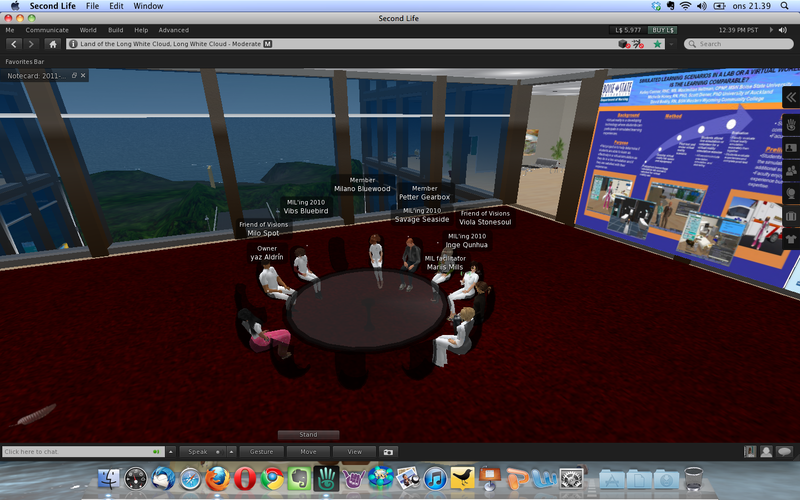 On Wednesday, January 19th Milano Bluewood, Savage Seaside, and Vibs Bluebird from the MIL-Health group did their presentation and analysis of SL as teaching and learning environment based on a Danish in-world project called CaseConnexion (Danish description). This is a project aimed at Nurse Education, and Milano is actively involved in the project. A pilot study was run in the fall of 2009, and it was the experiences from this study, the group had decided to present and discuss, and so naturally we started off on the island CaseConnexion. 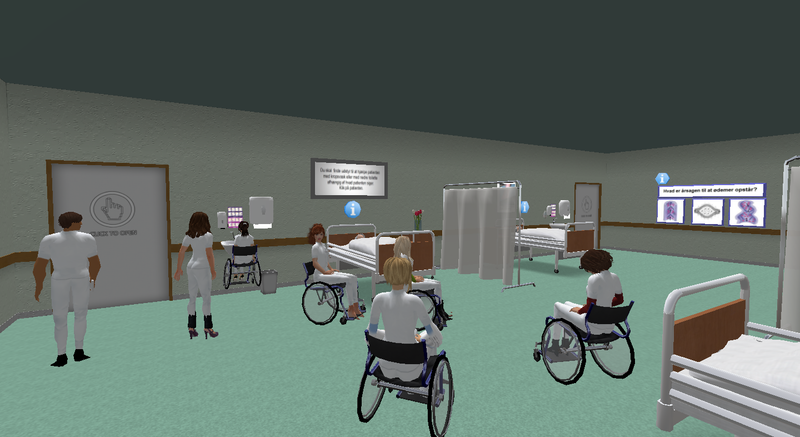 The main purpose of starting the in-world CaseConnexion project was to investigate its potentials in bridging/connecting some of the theoretical and clinical elements of Nurse Education. A survey, with answers from 85 students and 7 teachers, pointed to a variety of issues that should be addressed in future use of CaseConnexion (thoroughly described in this Danish evaluation report); steep learning curve, lack of identification with the avatar, fear of looking stupid in front of class-mates, technical difficulties and “waste” of valuable time spent on learning the system rather than the subject matter as a consequence of the former issues. These were all issues that we also had encountered and discussed during this MIL-course, and so the group wanted our feedback on ways to solve these problems. As the group explained, the survey fortunately also pointed to issues on the plus side such as variation in teaching and learning methods, and the ability to practice skills without actually hurting/harming real humans through case-based role-play. 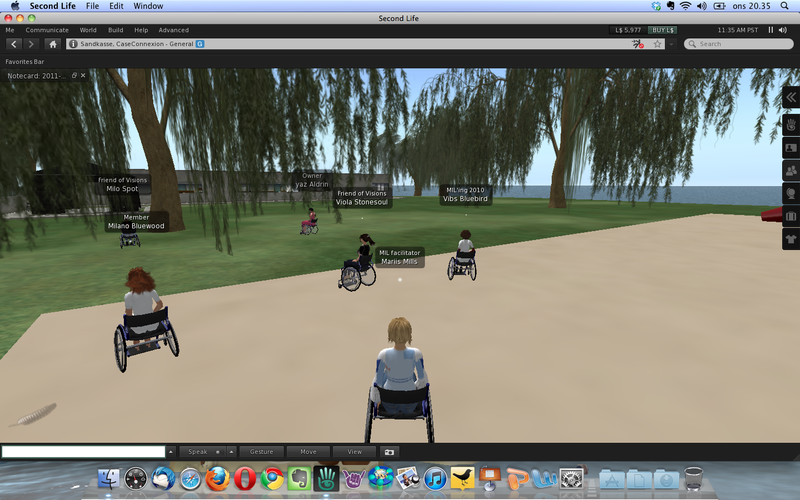 As part of the set-up for their presentation, the group provided us with wheel chairs, which contributed to set the scene. It was interesting to experience and observe how we all felt the limitations of this type of handicap, and this led to discussions on how design can enhance/limit the sense of embodiment. We were also asked to watch this brief Danish video abut the project. Racing towards the hospital … except that racing while taking pictures is a no-go in SL! First quiz at the entrance; pick the right uniform or you’ll not be allowed enter! 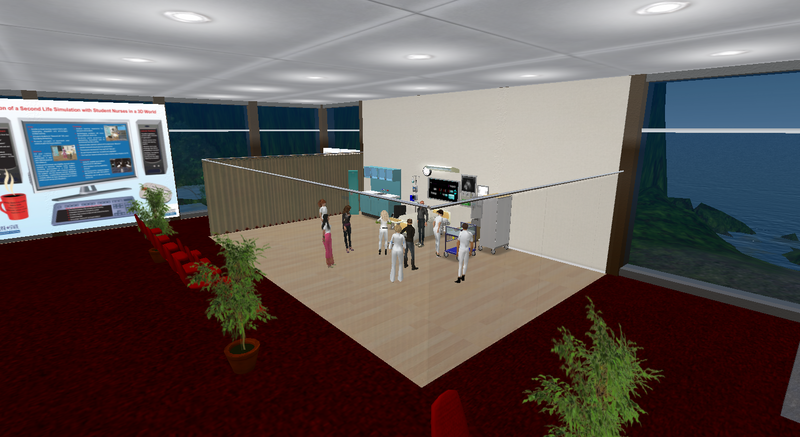 Reception area with free uniforms and bots to add to the RL-feel of this respectful remediation of a hospital environment. Wash your hands upon entrance into patients’ rooms – otherwise simulations don’t work. 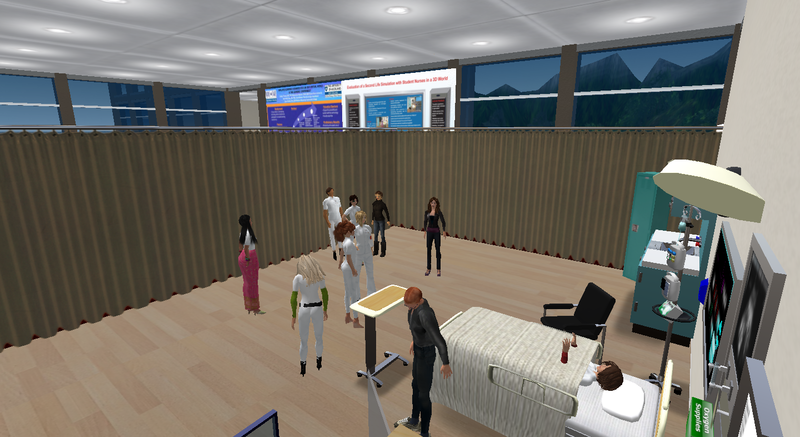 After exploring the hospital we went back to the sandbox, where Milano, Savage, and Vibs presented other, international examples of in-world Nurse Education – one of them being a project led by University of Auckland in collaboration with several other universities. After watching a few minutes of the video below, we were asked to go to the island Land of the Long White Cloud. In the hospital on the Land of the Long White Cloud, we had the opportunity to investigate a different patient room also designed to be used in case-based teaching and learning. An avatar (as opposed to a bot as we saw on CaseConnexion) can climb into the bed and actively participate in the case. … and the same patient room from the other side. 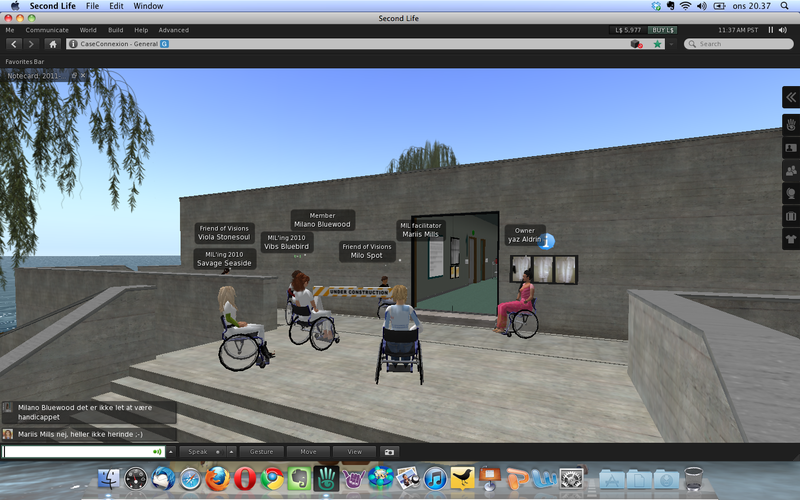 A nice feature enabling the instructors and other audience to overlook the simulation. Just as in real life – except for the ability to change POV. Having tried out different features of the patient room, the MIL-Health group invited us to the debriefing table, where we continued discussions on especially design for embodiment, sense of presence and collaboration. Milano, Savage, and Vibs had prepared a presentation, which in itself illustrated the connection between theory and practice, and it was refreshing to discuss some of the more difficult parts of designing for teaching and learning in 3D-avatar based worlds like SL. Thinking out-of-the-box … from inside the box!